The studio claims that daily activity on Android is double that of iOS - in fact, they say the online RPG is downloaded about 9,000 times a day on Android, compared to 3,000-4,000 times per day on iOS. Android users play the game about three times more than Apple's gamers (which is a major statistic considering the majority of their profit comes from in-app purchases). 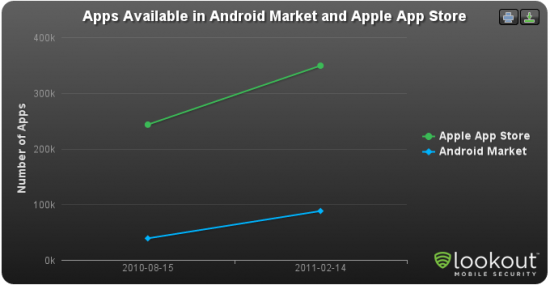 Additionally, Android users regularly account for 30 to 50 percent more revenue than iOS users. "We've just been blown away. 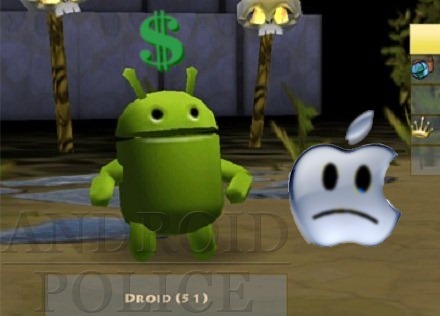 Android has become our primary interest," said Spacetime CEO Gary Gattis. Of course, your Apple-loving friends could legitimately argue that this is hardly a double-blind scientific study of the two markets; rather, it is simply one studio's experience. It could be that Android users are more likely to spend time delving into an RPG. It could also be that games with high production values like Pocket Legends are currently harder to come by on Android, so they are snatched up more often when they do appear. Whatever the reasons behind it are, we welcome this news and look forward to the gap in app selection (see Lookout Security's chart below) narrowing as more developers catch on to the potential goldmine that Android can be for a well-made title.